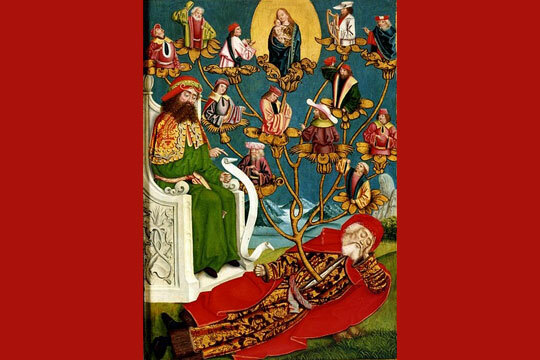 The theme for a recent session was “Jesus fulfills the Revelation of God found in the history of the Chosen People.” I realized I could make the connection this week by adapting an activity typically reserved for Advent—the Jesse tree. As the young people entered the room, I invited them to work on a worksheet on “Grand Genes,” which was a Bible look-up activity that asked students to look up promises in the Old Testament and their corresponding fulfillment in the Gospel of Matthew (BLM for Finding God, Grade 7, Session 3). This served the practical purposes of giving young people practice in using their Bibles and something meaningful to do while classmates gathered. It also invited them to start thinking about Jesus as the fulfillment of God’s promise to send a Savior. When everyone was gathered, we prayed an opening prayer together. Then I directed the young people’s attention to a work of art that I had covered with sticky notes, and I asked them to identify the picture. Of course, they couldn’t until I started revealing the image by removing each sticky note and allowing guesses each time I removed one. I was impressed by how few turns it took for one girl to identify the Pietà. Just as the image was slowly revealed, I explained, God slowly revealed himself to us throughout Salvation history. This led into the adaptation of the Jesse tree. Introducing the activity as Jesus’ family tree, I handed out paper, crayons, and markers to the group and gave each young person a slip of paper with the name of an ancestor of Jesus. 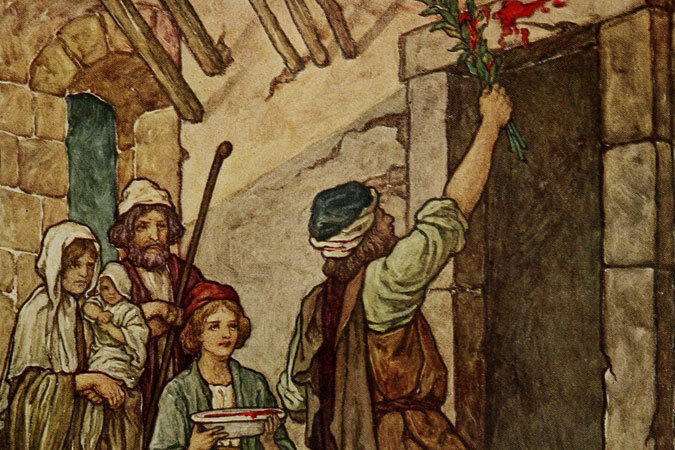 The slips included Scripture citations for each ancestor and a suggested image to represent the person—for instance, Adam and Eve and the fruit, Noah and the ark and rainbow, Moses and the tablets of the Ten Commandments. I directed the young people to read the Scripture and draw the symbol and then turn to the person next to them to share the story. As people finished each drawing, I collected the slips and redistributed them to others so that each person would be working with two or three stories by the end of the session. While the young people were happy to draw, they kept getting distracted from the story-sharing, which was the more important part of the lesson. To help with the sharing of stories, I started to run through some of the highlights with the whole group. This made me do more of the work than planned in the large group setting, but I did manage to get the attention of some of the students with stories they didn’t know and some of the action stories of the Old Testament. Perhaps that will give the young people an incentive to be more attentive in reading Bible stories in the future, if they realize that there is action and a relevant point to the stories. It’s definitely something we’ll be working on as the year continues. To close the session, we prayed a “Litany of Thanksgiving for Who I Am Today,” found in the young people’s book. This included the response, “We give you thanks, O Lord.” One of the girls said she really liked that response, and a couple of the other students agreed. I took that as an opportunity to tell the group to look for situations during the week that would prompt that same response and invited them to pray it anytime they encountered something or someone for whom they were thankful, which was a great place to end the session. Have you ever adapted a seasonal activity to use during another time of the year? Tell us about it. Image: Absolon Stumme, “Hamburg Altar (The Tree of Jesse),” 1499, public domain via Wikimedia Commons. Learn more about the artwork through Arts & Faith: Advent. 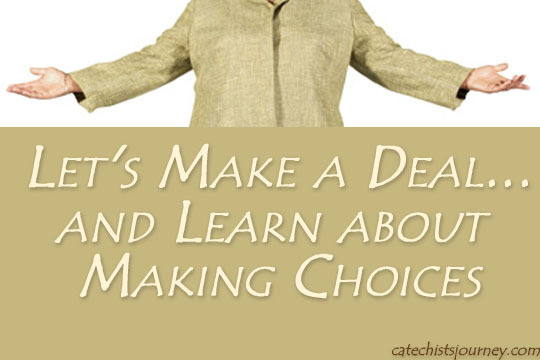 As a new Catechist, I am learning so much from your articles. Are any of your numerous topics available in a “print” format? I have one of those printers that uses a duel black & white, and colored cartridge, so when I print your very colorful cover story cover I use up cartridges quickly. Doris, use the Print-Friendly button near the end of articles to get a format that will allow you to skip printing the pictures. Welcome to the ministry!